The speak on button press feature works both for using the onscreen buttons and also on keyboard buttons, making this particularly useful for those with the extended keyboards with their own numerical keypad. If you’re not happy with the default talking voice, you can change that through the Speech preference panel contained within System Preferences, or you could even add new ones if you’d prefer a voice with an accent or just a different tone. 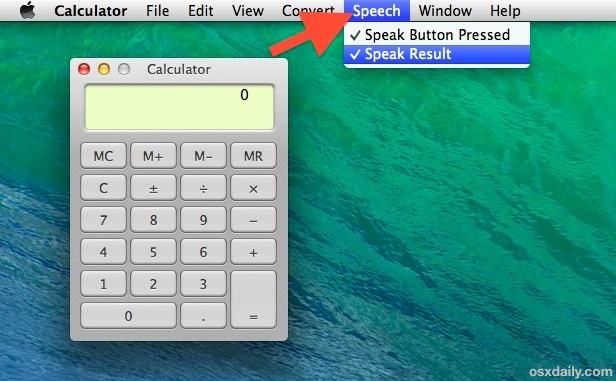 For the most part the talking calculator works flawlessly, both with the Basic calculator and Scientific calculator options, but there is a peculiar bug with the talking calculator function that prevents the full result from being spoken; the “Show Thousand Separators” option found under the view menu. For some reason with that enabled, the entire result won’t be spoken, and instead only the portion in front of the first comma will be verbalized. Also, the various conversion tools like currency and volume won’t speak their results, and neither will the programmers calculator option. Nonetheless, this is still a useful feature, and a nice one to have built directly into OS X without needing any third party apps. Mobile Apple users will find similar calculator functions in iOS with the built-in Calculator apps, and, going the opposite direction, you can speak equations to calculate with Siri in the world if iOS.